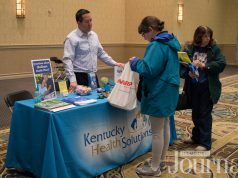 Lexington’s Senior Center off Richmond Road at New Circle hosted a Senior Health Fair with 50+ vendors. 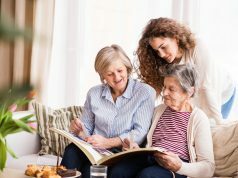 There is a Community Education Series seminar on the topic of when it’s time for your loved one to transition to a memory care community. 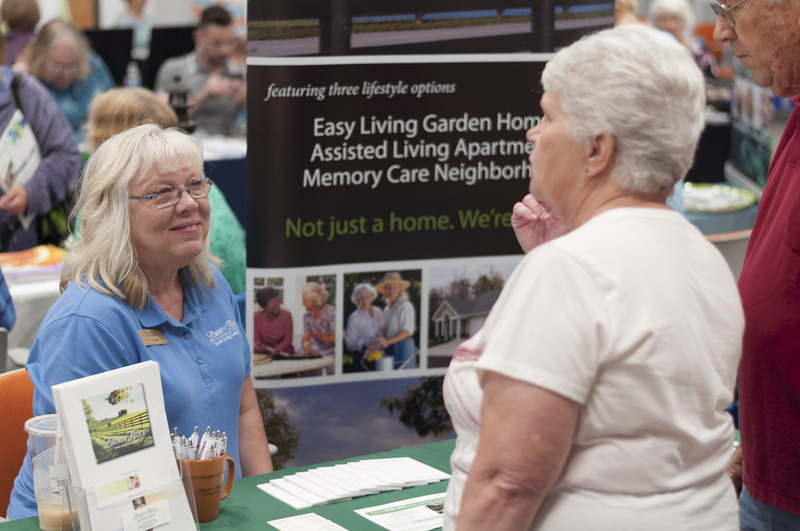 Presentation is August 2 at noon at Morning Pointe Senior Living. The Lexington Senior Center hosts an AARP Smart Driver Course on Monday, August 6 from noon to 4:30 pm. Attendees of the Lexington Senior Center need to be age 60 or older, Fayette County residents, and independent. 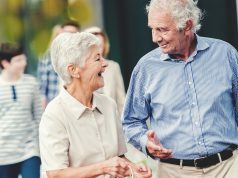 Morning Pointe Senior Living is hosting part three of the Parkinson’s Series Lunch & Learn on August 8. It features a Parkinson’s Virtual Tour provided by The Weston Group. 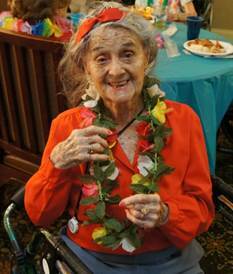 Morning Pointe resident Eloise Terry (age 102) dons a colorful lei in honor of the Family Night luau. There is a How to Build Strength seminar at the Lexington Senior Center on August 8 at 1 pm. Learn basic strength building concepts and how to use them in your daily life, as well as gym and home based exercises. The Lexington Legends offer a Silver Slugger promotion for their August 8 game against Asheville. Fans 55 years old and over receive free admittance. 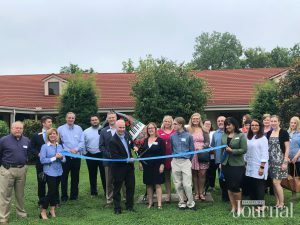 Morning Pointe Senior Living hosts Dog Days of Summer, a fundraiser to support Jessamine County Animal Care and Control (JCACC). From 5:30 – 7:30 pm you can bring by a donation and enjoy an evening of four-legged friends. The Trilogy Travel Club, in partner with The Willows at Hamburg, offers an all-inclusive travel service to Mackinac Island & Michigan’s Treasures August 20 – 24. 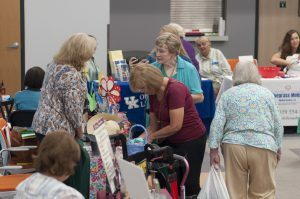 The Lexington Senior Center is offering a trip to the Kentucky State Fair on August 21. The bus departs at 9 am. 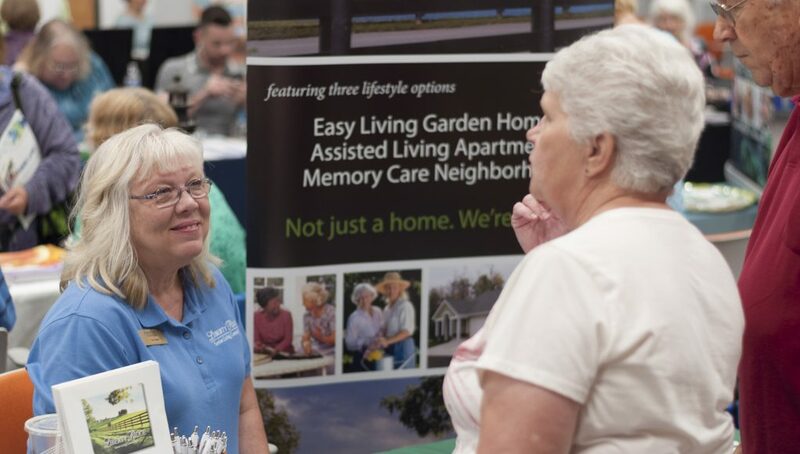 Always Best Care Senior Services celebrated the opening of their new office on Nicholasville Road and their one year anniversary. The Lexington Senior Center provides an Aging Support Group every fourth Thursday of every month at 10 am in the conference room. Participate in Lexington’s Walk to End Alzheimer’s on Saturday, August 25. Registration begins at 9 am at Fayette Circuit Courthouse on N. Limestone. Man o’ War Church is offering a Senior Adults Creation Museum Trip on August 25 from 11 am to 7 pm. Liberty Ridge Senior Living Community hosts the 5th Annual Classic Car Cruise-In on September 8. It’s open to the public from 2 – 6 pm. Carolyn’s Corner Book Club at the Lexington Senior Center meets on the first and third Thursday of each month at 10 am and is open to all. The August reading discussion dates are August 2 and 16. 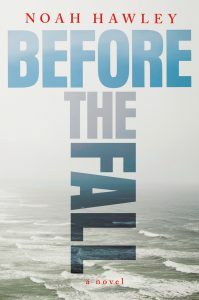 The August reading for Carolyn’s Corner Book Club is Before the Fall by Noah Hawley. It is the winner of the 2017 Edgar Award for best novel and the 2017 International Thriller Writers Award for best novel. Hawley is also the award-winning creator of Fargo. This article also appears on page 16 of the August 2018 print edition of Hamburg Journal.